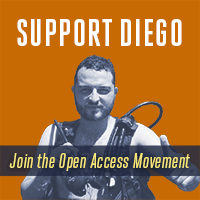 Colombian student Diego Gomez uploaded an academic paper to document-service Scribd a few years ago to share with his graduate school peers who, like him, studied biodiversity and amphibious animals. When the author of the paper later found out about this, he decided to press criminal charges against Gomez last year. Due to Colombia's heavy-handed copyright laws (which are called rights of the author, or derecho de autor in Spanish), he could go to prison for up to eight years as well as face crippling monetary fines. We first wrote about this case about a year ago, and now, following a series of delays, Gomez begins his trial this coming Tuesday, June 30. [Last year] I wanted to bring attention upon the case I was facing. A year has passed and because of your support, there are more of us who think that sharing can’t be considered a crime in Colombia, nor anywhere else in the world. In this time, the support received from different people and organizations has opened the debate about how the lack of balance in copyright laws may affect anybody, and thus is a matter that concerns everybody. Fundación Karisma is continuing to support Gomez in his case to fight against these excessive criminal charges. The organization says that he has good standing for a strong legal defense for two reasons. First, there was no malicious intent behind his sharing the paper online. Second, there was no actual harm to the author's economic interests as Gomez made no profit off of the paper.1 Under Colombian criminal law, the court must weigh both of these factors, and it would take a significant misrepresentation of facts to paint Gomez as a criminal who posted the paper online for private profit. What remains disturbing is that Colombia has such extreme copyright laws in the first place—which directly resulted from the country's trade agreement with the United States. The government reformed its criminal laws in 2006, in order to fulfill the trade deal's restrictive copyright standards. It expanded criminal penalties for copyright infringement as it increased possible prison sentences and monetary fines. Moreover, Colombia does not have a flexible fair use system like in the United States. It has a closed list of exceptions and limitations to the rights of authors. This list was issued more than 20 years ago and are so narrowly tailored that they don't account for all kinds of new digital tools and content uses. Instead of obligating Colombia to enact more safeguards for users, students, and innovators by including fair use in the trade agreement, the United States instead forced its trading partner to enact even harsher criminal penalties. This is the same problem we're confronting with the Trans-Pacific Partnership (TPP). The U.S. is continuing to negotiate deals where they are fighting for excessive criminal provisions that uphold the interests of Big Content at the expense of everyone else, by failing to encourage its trading partners to adopt crucial public safeguards like fair use. Gomez's case is one that demonstrates the terrible costs of secretive copyright policy laundering. He posted the paper online because he was excited that he found it, because he wanted to share that knowledge with others who shared his passion. Copyright should not turn students like Gomez into criminals for reveling in their quest for knowledge nor for helping others to do the same. We will be monitoring the case closely, as we continue to call on the Colombian government to drop all charges against him. If you haven't yet already, sign the global declaration of support for open access which has been signed by over 10,000 individuals. Are you in the United States? Then send a message to your lawmakers to secure open access to taxpayer-funded research and support the FASTR bill.